This month we discover some dark delights, but also encounter fiction bogged down in the end-of-summer doldrums. 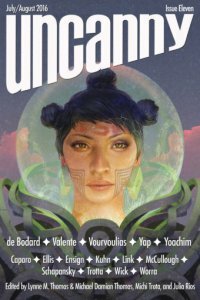 Of the five original stories in the July/August 2016 issue of recent Hugo-winner Uncanny Magazine, two can be said to be truly dark. The only element of the fantastic in ‘‘El Cantar of Rising Sun’’ by Sabrina Vourvoulias is a character’s magical tattoos. The reality of young black and brown people trying to survive the 21st-century inner city provides the horror. The use of Spanish and the almost hip-hop rhythm of this touching ‘‘song’’ may present obstacles to some, but it is worth the challenge. In Isabel Yap’s ‘‘An Ocean the Color of Bruises’’, a group of six college friends – Filipino young folks just entering the world of adult responsibility – take a short seaside vacation together. The hotel and beach are strangely deserted, the staff surly. The weird intrudes in the form of the drowned dead who, when killed by a violent storm, were also young. The narrator – who seems to be a single female even though the story is told in second-person plural – feels life (as only someone under 25 can) is grim and the future terrifying, which means that despite tragedy, this is a story of hope. Yap gives us five well-drawn characters in less than 6,000 words, and a straightforward story that is quite nicely done. Two good originals in Nightmare #46 (July 2016). The narrator of An Owomoyela & Rachel Swirsky’s ‘‘Whose Drowned Face Sleeps’’ is both two individuals and one woman. Then again, as she/ they say: ‘‘Everyone’s brain is a liar. Mine (hers, mine) is more duplicitous than most.’’ This is a complex story with several levels, told in vivid, unsettling imagery and indelible aphorism. (‘‘This is a ghost story…. No. It’s a love story. But all love stories become ghost stories if you watch them long enough.’’) Memorable. ‘‘This isn’t the story you remember, where a girl escapes the woods. It’s the one where she takes you back there with her.’’ Gavin Pate’s narrator in ‘‘Red House’’ is quite unreliable, or perhaps she is utterly and horrifyingly reliable. Told from a ten-year old victim’s point(s) of view, ‘‘Red House’’ is an old story told in a new (if not groundbreaking), more terrifying way. Nightmare #47 (August 2016), however, hits one home run and strikes out on the other story. In Amanda Downum’s ‘‘Fossil Heart’’, Nan is haunted by a past with which she cannot make peace. When monsters from that past threaten someone she cares for, she seeks to do the impossible: change the past to protect the living. An imaginative winner. ‘‘The Hunt for the Leather Apron’’ by G. Neri – written as a statement for police from Edward John Nichols, the son of Jack the Ripper’s first victim – is lacking. A fictional writer who spells words like ‘‘morgue,’’ ‘‘eerie,’’ ‘‘thieves, and ‘‘tongue’’ correctly while misspelling those like ‘‘sed’’ and ‘‘yeer’’ stretches credulity. The core of the story is weak – a son believes a certain man to be his estranged mother’s killer, for no real reason other than a dream of the murder – and detail after detail, the sort of touches that lend verisimilitude to setting and characters, are either missing or incorrect. Evidently, the author did enough research to establish there really was an Edward John Nichols, but – as evidenced by many historical mistakes that cannot be justified by the fact that this is fantasy – not much beyond that. When editors allow such problems in historical horror, the author is not solely at fault. Black Static # 53 (July/August 2016) published a variety of styles and themes in its half-dozen offerings. Priya Sharma takes a gothic turn with ‘‘Inheritance, or the Ruby Tear’’: noble family, a possible inheritance, lost love, mysterious reappearance, a significant piece of jewelry. Sharma combines a sincere (if refined) Matthew Gregory Lewis impression with gore and shock for an effective combination. Steve Rasnic Tem’s ‘‘Breathing’’ is much more than the metaphor and mood a casual reader might take it for. Read it slowly, savor it, and reread it. Charlie is obsessed with his own breath and the breathing he hears that is not his own. ‘‘The imagination always promises everything, both the wonderful and the terrible in unending supply, but at the end of the day it all goes away, leaving you alone in bed with the lights out and only the compulsive and enigmatic movements of the air to accompany you.’’ It’s further proof Tem is a master of craft and emotion. In ‘‘Dare’’ by Harmony Neal, three drunk high school girls play ‘‘Truth or Dare,’’ and things turn gruesome. Perhaps if the inexplicably footnoted details and descriptions of the trio added at the end had been included in the narrative, we might have cared. Kristi DeMeester takes us to the southern US in ‘‘The Rim of the World’’. Married couple Laurel and Jacob, childhood sweethearts, return – after a decade away – to the rundown deserted home of Laurel’s deceased grandmother. Jacob is more than uncomfortable with the marshy South Carolina locale and the memories of his sister’s strange behavior and consequent death. Laurel, however, delights in the place and exacerbates his fears with her own weird reminisces. 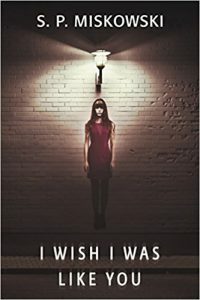 DeMeester adroitly builds diaphanous layers of dread and creepy atmosphere into an enveloping curtain of fear, but the ultimate reveal of Laurel’s true character rips through this veil a bit too suddenly for the reader to completely accept. Akio survives a tsunami, but loses his wife to the storm in Danny Rhodes’ ‘‘Tohoku’’. Beset with grief and guilt, he finds meaning in life only through obsessively searching for his wife’s body by diving into the sea where what is left of the village and its dead inhabitants remains. Heedless of his own safety, Akio himself is nearly drowned, but receives an oceanic message as a result of his near miss. In the face of overwhelming disaster, a fictional focus on the individual can bring understanding. It’s well done, but whether the story moves you or not probably depends on your personal experience with other literature of its kind. you of his excellence or utterly baffle. The issue’s final story, ‘‘In the Frame’’ by Charles Wilkinson, finds the smug Luke attempting to meet Callum, an old friend, at an art gallery Callum has designated. Luke does not find the gallery and, instead, has several strange encounters. When he finally locates Callum and the gallery, things get stranger still. Wilkinson etches his protagonist and his weird journey so well you are drawn into his nightmare before you know it. Shimmer #32 (July 2016) has four stories featuring children; only one doesn’t come under our apothic purview. ‘‘Painted Grassy Mire’’ by Nicasio Andres Reed is, more-or-less, magic realism that doesn’t really turn dark until the end. The story is set in Saint Malo LA in 1915. If you already know Saint Malo was the first settlement (mid-18th century) of Filipinos in what is now the U.S. then you’ll also know the village was wiped out by a hurricane in 1915. But even expecting this natural disaster, it is supernatural disaster that provides the darkness. Reed sets his finale up so subtly you assume this is a non-fantastical ‘‘literary’’ story until the very end. Like the Reed story, ‘‘The Wombly’’ by K.L. Morris, is concerned with transformation and has a young girl as its protagonist. The similarity ends there. This is a bizarre little tale about parasitic creatures – womblies – that transform their human hosts into soap, tin, or wool. Family obligation and love are the central themes in the simple but affecting story. ‘‘The Singing Soldier’’ by Natalia Theodoridou is a brief parable with a message that will probably be interpreted differently by each reader. The daughter of a happy peasant family comes into the possession of a singing tin soldier. The family accepts the odd toy and sees it as good fortune. They can glean the meaning of only a few words of the otherwise indecipherable language of its perhaps prescient songs. Things take a bad turn for the family, and ultimately the daughter uses the toy in a way one could not predict at the story’s start. It is an appealing story, but I can’t really pin down why. The Dark #15 (August 2016) offers two originals: ‘‘Floodwater’’ by Kristi DeMeester and ‘‘Some Pictures of Monsters’’ by Rhonda Eikamp. A deluge of seemingly unending rain is falling in DeMeester’s story, and young Kayley’s mother is emotionally drowning, much as she did after losing a baby daughter three years before. The birth of a healthy son some months previously has not erased the mother’s grief; her postpartum depression may be deepening into psychosis. 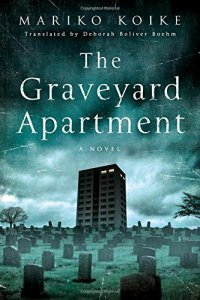 Although DeMeester effectively builds the disquieting story with hints and intimation, narrator Kayley’s voice and behavior is not consistently that of a seven-year-old. Perhaps this doesn’t bother other readers; for me, a few minor changes would have vastly improved the tale. ‘‘Some Pictures of Monsters’’ by Rhonda Eikamp is a gritty take on the folk/fairy tale we know as ‘‘Cinderella’’. She retains the theme of a young woman whose unfortunate circumstances are suddenly changed to remarkable fortune, but the stepmother uses sorcery to change her stepdaughter, the ‘‘sooty one,’’ into a partner far more suitable for a monstrous prince than she intended. Eikamp structures the story as a series of images: an ingenious device, but it neither adds to or detracts from her satisfactory story. Although Apex Magazine is a ‘‘science fiction, fantasy, and horror’’ magazine, all three of its original stories for August 2016 (#87) are dark. ‘‘The Gentleman of Chaos’’ by A. Merc Rustad is a poetic dark fantasy with some elements of the epic – power, kings, assassins – that turns out to be an examination of duality/identity. Alexis A. Hunter’s brief, SF-nal ‘‘Fall to Her’’ is (literally) half poetry. It is a tale of truly forbidden love between a fleshly spacefarer and an alien siren. The protagonist of E. K. Wagner’s ‘‘I Remember Your Face’’ is Ket. Wagner switches back and forth between a noir-ish (current) story of Ket as an adult bounty hunter in a post-apocalyptic dystopia and an account of the end of her (past) childhood. As a child she is drawn to crows; her mother warns her of them. As an adult, she has some symbiotic relationship that I don’t understand. Even at 7,000 words, this one is more sketch than completed work. We have again come to the end of our allotted space. By the time this is published, October – high season for horror – will be upon us. Be prepared!